Many people have bleeding gums when they brush and are eager to find out the causes. Gum disease, with sore, swollen, or infected gums, is a very common problem. Patients may develop a condition known as gingivitis, characterized by bad breath and bleeding gums during teeth brushing. If the gingivitis is ignored, it may progress to another condition termed periodontitis, which affects the supporting tissues surrounding the teeth keeping them in place. There are also other causes to watch out for. Why Do My Gums Bleed When Brushing Teeth? 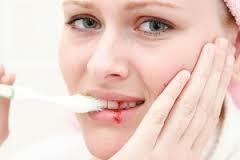 You may have or be in danger of developing gum disease if your gums bleed. Continuing bleeding could be a result of a serious illness, such as leukemia, bleeding disorders, or platelet disease. Here is a list of bleeding gums causes due to both gum issues and non-gum issues. Over-brushing will irritate the delicate gum tissue. This can result in soreness, inflammation and bleeding. Incorrect flossing can cause gum trauma, cutting through the delicate gingival tissues. Badly-fitted dentures, or other oral equipment may damage your gums. A poor diet can affect your gums. You need to eat the recommended amount of fresh fruit and vegetables each day, in addition to sufficient grains, dairy and protein. Smoking is a major cause of gum disease. The smoke inhaled contains toxins that irritate the teeth and are tricky to remove by brushing or with mouthwash. Certain medications, for example anticonvulsants, such as Dilantin, blood pressure drugs, immuno-suppressants, and blood thinners are known to play a role in the development of gingivitis. Any condition that causes dry mouth will allow food to build up on the teeth and gums without saliva to wash it off. This may eventually result in gingivitis. Plaque is a sticky yellow-colored material full of bacteria that builds up during eating and drinking. Accumulation of dental plaque may lead to gum disease. Although some bacteria in plaque are harmless, others can badly damage your gums. Therefore, if plaque is left on the teeth for a while, it can irritate the gums, leading to gingivitis, and if it’s ignored, it may progress to periodontitis. Symptoms: The gums will become sore, red and swollen. As the condition develops, the gums may become redder and puffy, bleeding sometimes, although this is not normally painful. Pockets may form between the teeth and gums, and abscesses may develop here, which leave a bad taste from the pus leaking out. Furthermore, if food is allowed to rot in these gingival pockets, you may get continuous bad breath. Bleeding disorders increase the risk of bleeding throughout the body, particularly the gums, which have a large blood supply. Leukemia patients may easily bruise or bleed, which may manifest through gum bleeding. Changes in the levels of female hormones during pregnancy or menstruation can affect the blood supply to the gums. Hormones also control your risk of plaque accumulation through modifying your body’s response to the toxins in plaque. Scurvy is the medical name for chronic vitamin C deficiency. Without adequate vitamin C, collagen in the gums starts to break down, resulting in bleeding and recession. Particular nutritional deficiencies can cause gum disease, for example a lack of vitamin C or vitamin K.
Idiopathic thrombocytopenic purpura is a condition where the patient has insufficient platelets. This inhibits blood clotting, leading to bleeding, including from the gums. As the gums are quite soft, brushing your teeth with a hard-bristled toothbrush may cause them to swell and bleed. For a gentler alternative, choose a brush with softer bristles. You’ll need to brush your teeth twice daily – once in the morning and once before you go to bed. Practice regularly flossing too. By doing this, you will get rid of any food particles and plaque stuck on your teeth after meals. The most common type of food debris on teeth is from sugary and starchy carbohydrates, for example, potato chips and candy bars. If these are not quickly removed from the teeth and gums, they can remain around for a long time. Refined carbohydrates, found in lollipops, chocolate, and hard candy, coat the teeth in sugar, giving rise to tooth decay. Therefore, to prevent any damage to your gums, you’ll need to brush your teeth straight after consuming these kinds of food. If you have vitamin C deficiency, incorporate citrus fruit into your diet like oranges. Individuals lacking in vitamin K should eat more leafy green vegetable, such as spinach and kale. It’s best to eat fruit and vegetables with high water content, for instance melon, pears, cucumber, and celery. Drinking lots of water, particularly following meals, will wash food from the teeth, and decrease the chances of plaque developing. If you do have gum problems, try to cut back on hot food and drink, as this can irritate the gums. Lukewarm food and drink may be a better choice for you. Make sure you see your dental hygienist at least every six months to remove any plaque that has accumulated on your teeth. He or she can also advice you on brushing and flossing techniques for sore gums, as well as other home remedies. Ask your dentist about getting a periodontal evaluation. You’ll also need to speak to your dentist if you have any problems with dentures or dental appliances rubbing against your gums. An oral massaging device on a low setting can be used to gently massage your gums. Using a mouthwash that contains alcohol may worsen your gum issues. Try using salt water, or hydrogen peroxide and water instead, but make sure you have the right quantities.